The New York Taxi Workers Alliance has announced on Twitter that it is halting passenger pickups at JFK airport in protest of the dozens of people detained under President Trump’s Muslim immigration ban. The Alliance announced that it would be halting pickups at JFK from 6 p.m. to 7 p.m. to protest reports of at least a dozen people who have been detained in the airport due to the immigration ban executive order signed by President Trump yesterday. One green card holder was released from detainment earlier today. The immigration ban prevents people born in predominantly Muslim Iran, Iraq, Libya, Somalia, Sudan, Syria and Yemen from entering the U.S., despite many who have been previously vetted, hold green cards with permanent U.S. residence, or even UK politicians. The ban also suspends the Syrian refugee program indefinitely, and prioritizes minority religions, like Christianity, in the seven named countries for entry into the U.S. The Department of Justice reports that it was unaware of who in the White House was responsible for writing the immigration ban, which the President forced into action overnight with the executive order. Two Iraqi men detained at JFK who were granted visas and have working connections with the US military have filed a lawsuit against the President and the US Government, and have also filed to expand and cover all other detained immigrants and travelers. 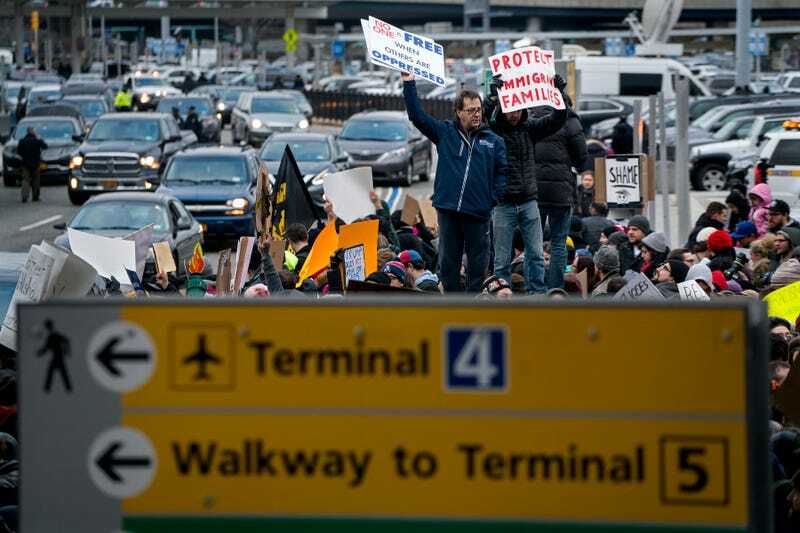 Meanwhile, the New York Taxi Workers Alliance work stoppage joins a growing protest against the immigration ban outside of JFK airport.